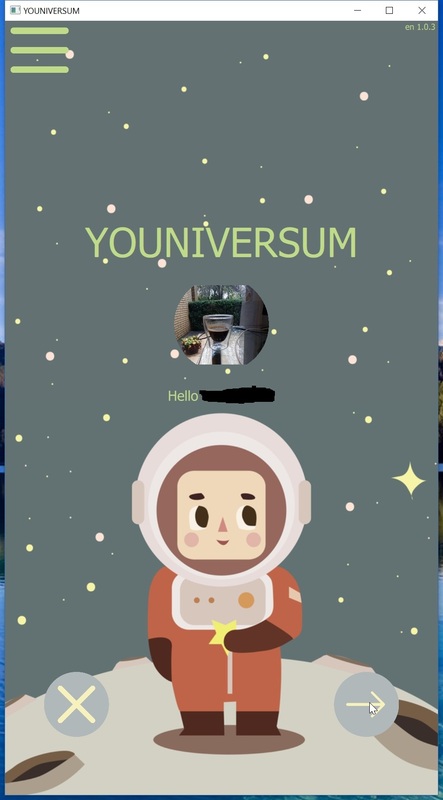 Youniversum is an Android application where a child shares emotions with parents and/or caretakers. For young children (for instance, diagnosed with autism spectrum disorder) it is sometimes difficult to share emotions with their parents. This in turn could lead to frustration. The application aims to alleviate such a situation by letting a child create events during daytime and share them with their parents. The application provides a timeline where parent and child can discuss the events in a structured manner. For instance when a child comes home from school, and wants to share all the things that have happened during the time the child was away from home. Parent and child sit together and talk about it while watching the events that have been created using the application. 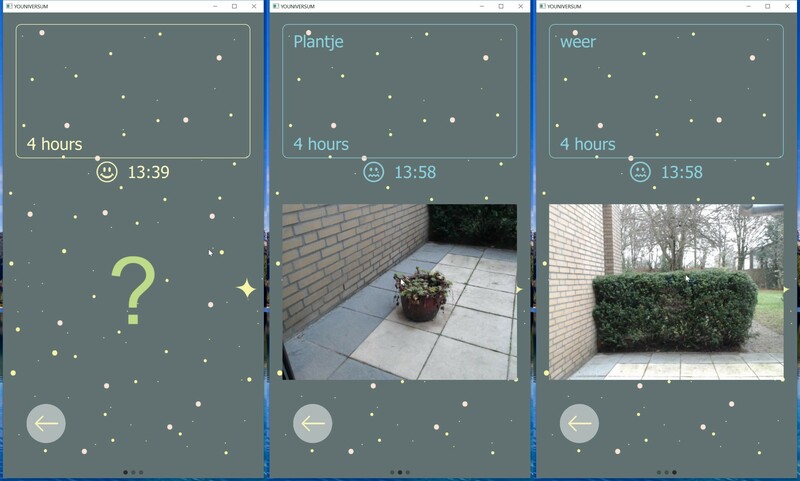 The application has been developed in close collaboration with the University of Eindhoven (Y. Jin and E.I. Barakova) and is being tested and evaluated at the regional autism center in Helmond (B. Kamer). The application is downloaded from Googles “Play Store”. 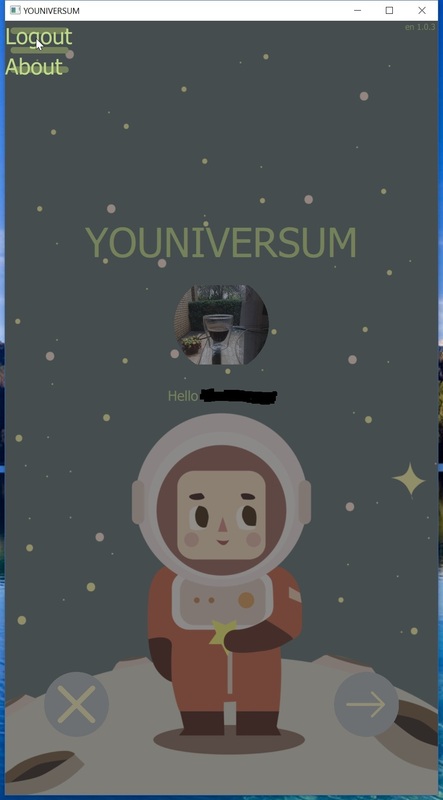 Click on the “Play Store” icon and type “Youniversum” or “TiViPE” and search for the Youniversum icon: Click to install the application. 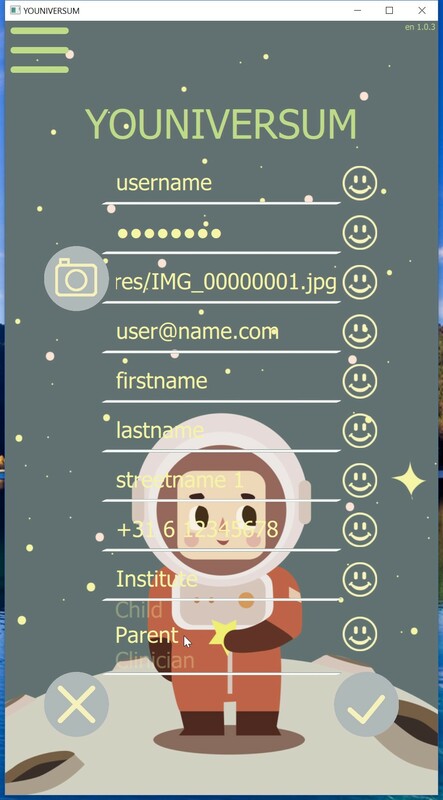 Sharing emotional events between parent and child, requires both parent and child to be registered with a unique username. Registration needs to be done just a single time. Please fill out the form accurately by choosing an appropriate username and a nice icon. Start the application and click on the grey button with arrow in the register area. Fill out all 10 fields. The photo or icon field requires an existing file, be sure to select the right icon image. The last field allows the user to set the type of user, either “Child” or “Parent” needs to be set by moving the field slightly upward or downward like a tumbler. As soon as one field has been filled out properly, a smiley appears, and when all fields are filled out, the grey check button appears. Press this button to complete the registration. After the registration has completed, a hello message appears and the user is ready to use the application. 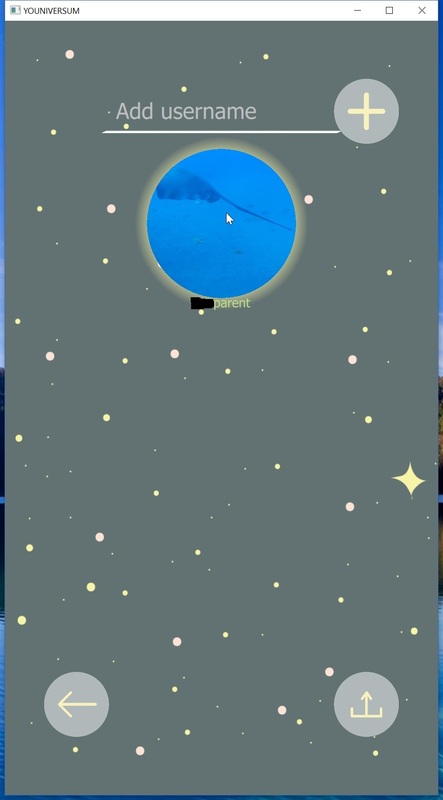 Also when quitting the application (by pressing on the grey button with the cross) and starting it again brings the user to this start screen. 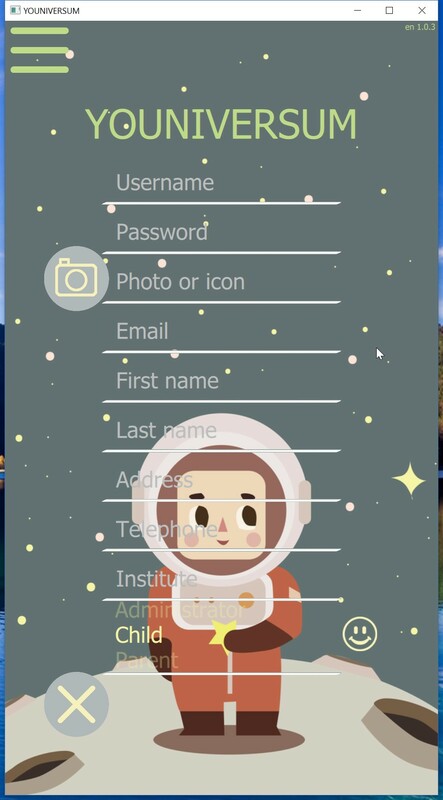 Occasionally both parent and child might want to use the same hardware, and in that particular case the user can quit the application by clicking on the 3 stripes on the top left part of the application, click “Logout” to quit the application. The next time the application starts up a new user can be registered. The other alternative is to login by providing a registered username and password. Note that as soon as both are given a button becomes visible, click this button to login. 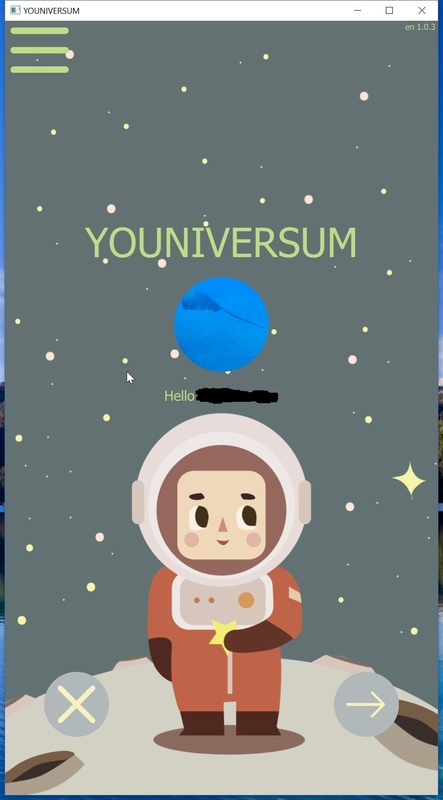 Every time the user starts the application a hello message and user icon are shown. The user is ready to start, by clicking the grey button with the arrow. 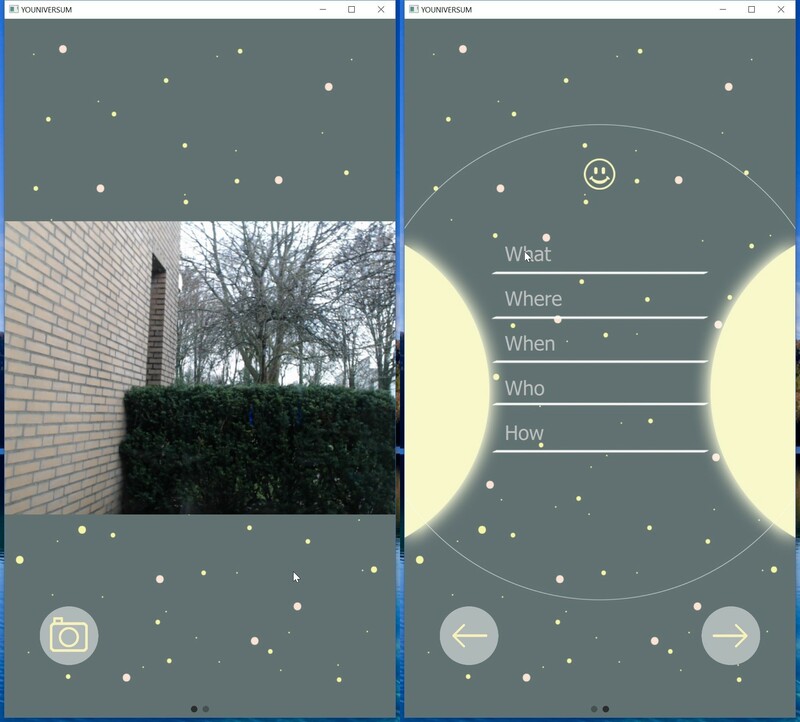 The happy planet page will be shown and user can now select one of the other emotional planets by swiping in horizontal direction. The user can select from “Happy”, “Sad”, “Angry”, and “Fear” planet page. On each planet page a score is given, this score increases by one every time the user creates a new event. For sharing events the user receives 10 points. The planet gets more detailed an more beautiful every 200 points until the maximum score of 1000 has been reached. The left upper gray button, to share all events that have been created during the day. The plus button to add an event. 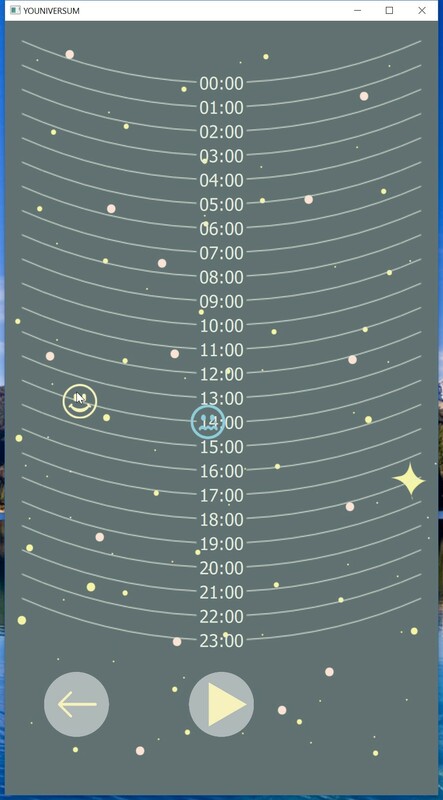 The planet itself, to share one or more events of a specific day using a calendar. The grey button with the left arrow brings the user back to the start page. The two event creation pages are activated when the user clicks on the plus button of the planet page. The pages consists of a camera and text page. 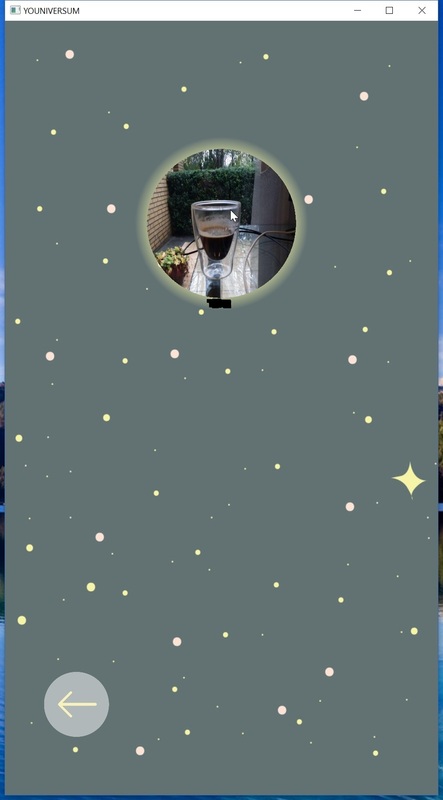 On the camera page an image is created by pressing the camera button. 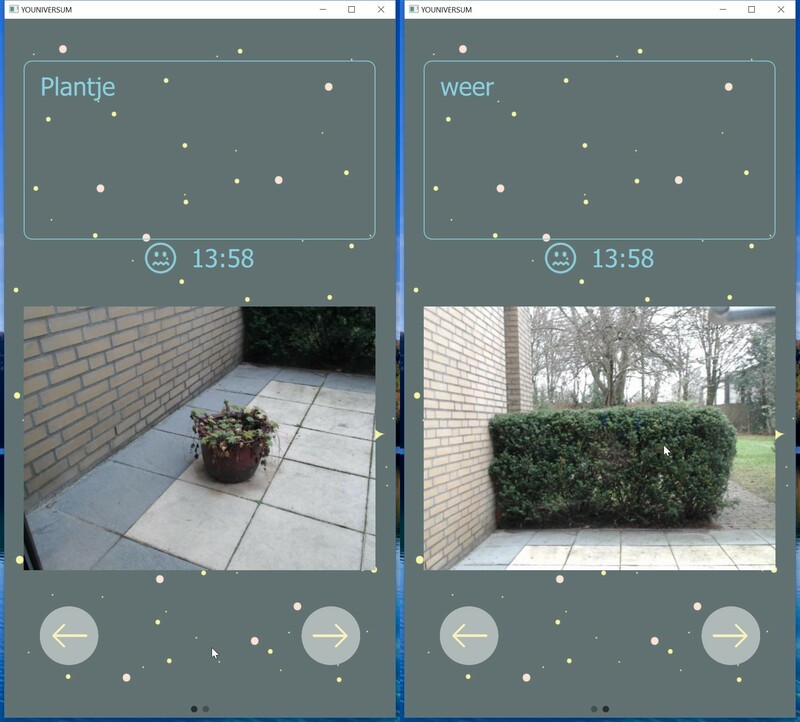 By swiping to the text view, the user can fill out in a few words or sentences what exactly has been observed and caused the emotion. By pressing the lower right arrow button on this page the event is created. Clicking the lower left arrow button brings the user back to the planet page. On the planet page, by clicking the planet itself activates one calendar page. The calendar page correspond from left to right to the “Happy”, “Sad”, “Angry”, and “Fear” planets, respectively. 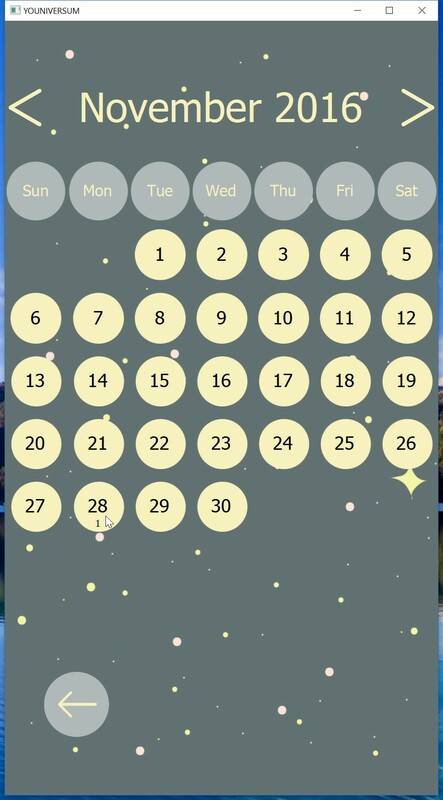 The user can select the desired date, and by doing so a timeline page pops up that shows all events that have been created during the day. On the timeline page the user can select a single event by clicking on the icon, or get an overview of all icons by pressing the play button, which gives the user the opportunity to swipe from event to event, and select the desired one by pressing the gray lower right arrow button. After clicking this right arrow button a page where the user can share the selected event becomes visible. The first time the user visits this page there is no parent to share the event with, hence the username of the parent needs to be added by typing the name and pressing the grey “+” button. By repeating this multiple parents and caretakers (who have registered) can be added. Once this is done the icon of the parent becomes visible and the user can select the parent by clicking on the icon and then press the gray share button at the lower right of the page. The busy icon will become visible to indicate that the event is being shared with the parent. Once the event is shared the share button is not visible anymore. A parent or caretaker uses the same application as the child. The application therefore has a similar behavior. The difference is that the parent user is only able to see the events of the child that have been shared. 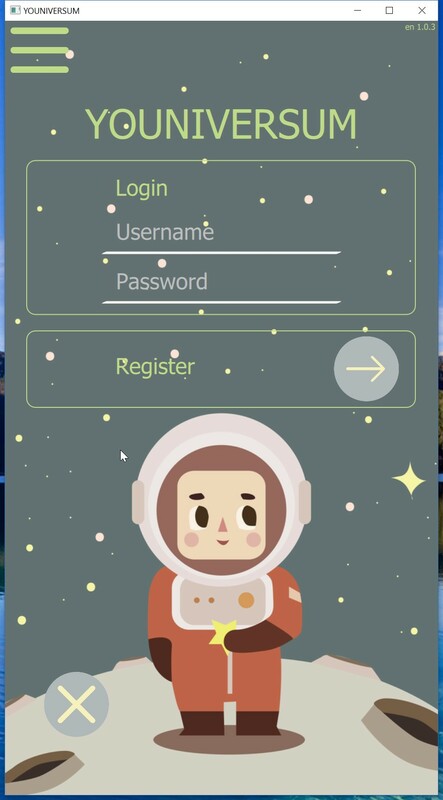 When starting the application the user will also go to the start page. Clicking the gray arrow button will bring the user to a page where a child can be selected. In case nothing has been shared nothing is clickable and the user can only go back. 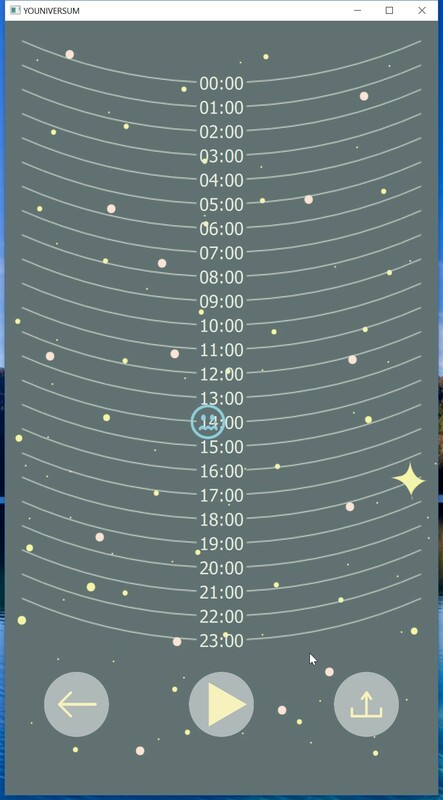 Pressing a child icon opens a calendar page, and by selecting a date in the calendar the timeline page is opened. In the timeline page the user can either click on an icon to see a single event or press the grey play button to view the shared events. In this example, the leftmost event is an event where the child has neither made an image nor provided any text. The child just shared the moment. The other 2 events that have been shared by the child, contain an image and only provide the “what” field. The parent also obtains the time elapsed between event creation and sharing.